Did the San Diego Zoo “Euthanize” Two Elephants Prematurely? Questions are being raised by former elephant trainers and handlers about whether the San Diego Zoo “euthanized” two adult elephants prematurely last week – before they were needed to be put to death. Two Asian elephants were put to death last week because they were “ailing and aged” we’re told. On top of that, we are raising a question of why the story about the elephants being killed was ignored by U-T San Diego and had to be broken by the LA Times. Perhaps, it was too messy and ugly a story to run for the U-T’s new owner, Papa Doug Manchester, and his image of a bright, shiny and wonderful San Diego that he wants projected by his daily fishwrap. On Friday, January 6th, the LA Times ran a front page article by Tony Perry on their local section about our Zoo euthanizing two ailing elephants. The Times reported that Cha Cha, about 43 years old, and Cookie, about 56, were both “ailing and aged” and were “suffering and their chances for recovery were virtually nil” declared an un-named Zoo official. Cha Cha and Cookie may been ailing but they were not elderly, not by elephant standards. Elephants mature and age the same as humans. No one would consider calling a 43-or 56-year old elderly. Some wild elephants live well into their 70s. Premature deaths in captivity are not only tragic, they are also reminders of why we should not keep such complicated animals in captivity. The physical, mental and emotional needs of elephants far exceed our ability to humanely keep them in zoos. Many enlightened zoos have made the decision not to keep or exhibit elephants for this reason. After all the elephant deaths and controversies through the years, why can’t the San Diego Zoo follow suit? At least one other former Zoo elephant trainer we know is also very upset about the premature killings. 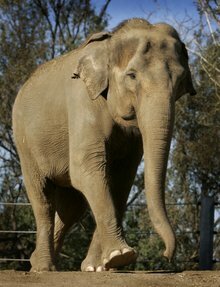 Two ailing and aged elephants at the San Diego Zoo had to be euthanized this week, zoo officials announced Friday. The two Asian elephants were suffering and their chances for recovery were virtually nil, officials said. Cha Cha, estimated to be 43 years old, was euthanized Wednesday. To allow other elephants to see her a final time, her lifeless body was lifted on a forklift and taken to where other elephants in the Elephant Odyssey exhibit are kept. Cookie, estimated to be 56, was euthanized Friday morning. There was no connection between the decline of Cookie and Cha Cha, officials said. Both elephants for decades were at the zoo’s Wild Animal Park — now called the Safari Park — before being moved to the zoo in 2009. Before such performances were halted, both were stars in the elephant shows at the Wild Animal Park. Cha Cha, the smallest elephant at Elephant Odyssey, was often seen in the company of Ranchipur, the 12,000-pound dominant male. Elephant keepers performed an emergency procedure on Cha Cha on Christmas Day after noting that she was having trouble eating and drinking. A large mass of food blocking her esophagus was removed. But within two days, she began to rapidly decline. Cookie had been in distress for months with a variety of geriatric problems and had begun to drag her back legs. She was given large doses of pain medication but zoo specialists concluded that her condition was irreversible. Elephant Odyssey, one of the more popular exhibits at the zoo, was closed temporarily but was reopened Friday. But elephant keeper interactions with the public have been cancelled to provide time for them to mourn, officials said. Cha Cha arrived at the Wild Animal Park in 1971, Cookie in 1981. Their deaths come just weeks after Umoya, 21, an African elephant at the Safari Park, was killed in an attack by another elephant. The zoo now has five elephants at Elephant Odyssey and 17 at the Safari Park. The zoo elephants are older than the elephants at the Safari Park and need more attention from the zoo’s elephant care center, officials said. SAN DIEGO — San Diego Zoo officials say two of their Asian elephants were euthanized this week for health problems that could not be reversed. Forty-three-year-old Cha Cha was euthanized Wednesday and 67-year-old Cookie was put down Friday. Zoo officials say Cha Cha received around-the-clock intensive care after surgery to remove an obstruction in her esophagus on Christmas Day. Cookie had been under veterinary care for some time for age-related problems. 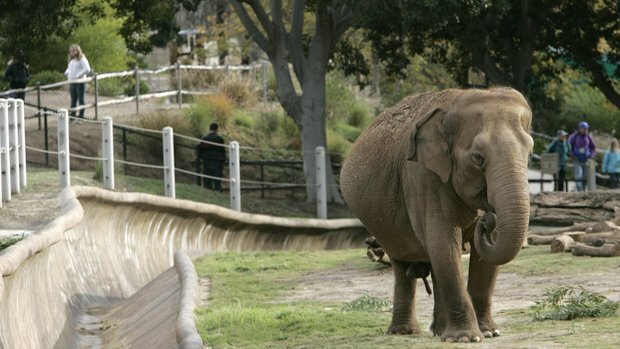 Zoo officials told the Los Angeles Times ( http://lat.ms/xM9YT5 ) the elephants used to be in shows at the zoo’s Wild Animal Park, now Safari Park, before they were moved to the zoo’s Elephant Odyssey exhibit in 2009. The zoo now has five elephants at Elephant Odyssey and 17 at Safari Park. Older elephants stay at the zoo, closer to the Elephant Care Center. The U-T did run a follow-up article the next day, Jan. 7th, by Kristina Davis, but no mention of doubts, questions, or premature issues. And we’re still wondering if Papa Doug wants to keep his presentation of a squeaky-clean city so much that he is willing to let the messier and uglier stories slide by. If so, that means more work for us – and we’re not paid. This is an interesting article. I would like to note, however, that the average lifespan of an elephant is approximately 40 years both in the wild and in captivity. While the longevity (maximum lifespan) of all three elephant species can be reach into the seventies, the life expectancy (average age at death) is about forty years. For example, humans can live to be 120 years old, yet the life expectancy for Homo sapiens is approximately 77 years. Not all humans, only a small percentage, will live to be 120 years. This applies to all living organisms. The problem is that many zoo professionals and even some scholars believe that the average lifespan is in fact 70 years, but the data does not support this. Landers even notes “some wild elephants live well into their seventies.” Some is not equivalent to most or all. For further reading I suggest Wiese and Willis (2004) and Hutchins (2006). We went to the zoo the day after it was done, we saw the saddest faces on the trainers/keepers. They were not thier selves. If you think it was difficult to make the discussion, you should have seen or felt the mood that came the day after. San Diego zoo’s keeper really care about thier animals. Lisa’s comments equal a former, she was not there… Rest in peace Cha Cha and Cookie, I’ll miss you and so will your care takers. Dr. Michael Hutchins, the Association of Zoos & Aquariums- Department of Conservation and Science. 2) Read from wild elephant experts regarding life span and those that understand zoos CAN NOT accommodate the needs of elephants emotionally or physically (one article below includes dialog from Hutchins another from a renowned sanctuary co-founder in response to a Hutchins article). The lifespan of a wild Asian elephant is 60-70 years. “The paper compares data on 4,500 captive female elephants in Europe – about half of the world’s captive female elephants – to information about wild elephants in Amboseli National Park, Kenya, and a captive elephant population at the Myanma Timber Enterprise. It found zoo-born African elephants had an average lifespan of 16.9 years. In the wild, the average lifespan is 56. Although it is a shame that two elephants couldn’t make it to the expected age of 70, it is unrealistic to say that ALL elephants should, especially in the wild, reach that age. I loved reading your description of the UT as fish wrap. I have not purchased a copy or even gone to signonsandiego since Doug Manchester purchased it. I would never want to do anything to support that person in any way. To call a 43 year old elephant “aged” could only happen in the zoo and circus world. Perhaps before taking a life the zoo directors might have considered asking for help from the sanctuaries. Have many “aged” and “ailing” elephants have been sent to sanctuaries only to thrive, and live out their days in relative freedom? I would have believed the sanctuary if they deemed the animal was suffering and “needed” to be euthanized, the zoo?..not so much. Where the is life, there is hope….except for zo0 elephants. I believe the zoo did it to make room for Connie from Tucson who should not be separated from her companion of 30 years in the first place. One thing a person will learn when researching zoo elephants is that their master, the AZA, is a heartless slave trader. The SDZoo did not have room for Tina & Jewel, but took them to make sure that they did not go to PAWS sanctuary (AZA hates their successful competition), then loaned them to the LA Zoo because of the lack of room in their bleak and barren exhibit. Elephants don’t live in zoos, they wait to die there. Why does nobody question an elephant dying in sanctuaries, but jump all over zoos if one dies there? That honestly doesn’t make sense. The keepers at either place give their elephants the best care possible, at both places they receive veterniary care, and at both places they receive medical attention. What is so magical and special about sanctuaries, anyways. They are under different jurisdiction, and don’t have to release medical records, so many times, one never finds out exactly what happened to cause the death of an animal there. Look at The Elephant Sanctuary’s page. Several elephants have died there, but only a select few was there ever any information on cause of death. Why does nobody question this? And if the cause is posted by a zoo, why does everyone jump down their throat questioning their ethics? Double standards aren’t okay for anyone! If you are going to question SD Zoo, you should also beat down PAWS for euthanizing their 30 year old bull. What if they could have fixed his arthritis, but they just didn’t have the money to spend on expensive treatment that he could have received at a zoo? Why is no one questioning that? It’s sad to see people trash a facility that spends millions of dollars to take care of animals and allow us to visit and see animals many of us would never get to enjoy in person. Tina and Jewel were moved by the USDA (http://www.aphis.usda.gov/newsroom/content/2009/08/elephant.shtml) to the SD Zoo to help rehabilitate them. And the LA Zoo just built a new elephant facility so why not move them there when they were ok? Not everything is a conspiracy. It’s as if all of the negative comments come from people who have never owned a pet and had to make that incredibly hard decision to put an animal down that has a poor quality of life due to their health. Do you all really believe in that “farm” that your parents took your favorite dog to when they got older? They are there now to play with all the other animals on the farm? Did they all live to the AKC’s expected age range? While it would be great to have an expansive wilderness to let all animals live in we all know that isn’t realistic. Even many of their native habitats there simply isn’t room. I guess none of you will be willing to admit that and would simply prefer to have all animals die from lack of a habitat and an unwillingness to let them live in captivity where we can enjoy seeing them and provide us with a lasting impression of why we need to take care of the planet. Do you know most elephants in captivity would have been culled in their homeland for lack of room? And as to how long an animal will live in the wild vs captivity – how many of you have a living will? How many of you want to be on life support at 50 or 60 years because you contracted a disease but the life expectancy of a human is 80+ so we should keep you alive until then? I really hope your families keep you stuck with tubes for years because you aren’t living up to your potential of years on the planet. Don’t like it? Move to someplace w/o a Zoo. SD Zoo – I know it’s a tough job and decisions are sometimes hard but I appreciate all you do. Michael, did you even read the article? In it, if you did, is quoted Lisa Landers, a former San Diego Zoo elephant keeper, who is very critical of what they did to the animals. You know Frank, I’m thinking that this comment by Michael is an example of what I’ll call internet “beer goggles”; wherein some individual feel so empowered by their relative anonymity that they end up saying stuff that is completely disconnected from the situation. “Move someplace with out a zoo?” Really Michael? Don’t you feel just a little silly with your hangover this morning? Yeah, I read the article. And the author said to not keep elephants in captivity because they are complex animals and other Zoos have made that decision so why shouldn’t SDZ? Most Zoos made that decision because they don’t have ROOM or they can have multiple number of species in the same space that elephants occupy. And if elephants shouldn’t be in captivity, why was the author an elephant keeper? Because they needed a voice? An undercover sting operation? Talk about goggles, more like rose colored goggles. That article looks a lot more like an employee that simply didn’t get along with their employer. I’ve worked for companies that I didn’t like, don’t work for them anymore and don’t like the way they do business. But does that mean that the company is bad or that I just don’t like the way they do business? If the Zoo had keepers leaving left and right because of bad business practices or mistreatment of animals that would be one thing. But one former employee that doesn’t like it, well, I’m not willing to blame the organization for having to make a touch decision. When the SDZoo implemented the protected contact way of doing business, certain keepers didn’t like that and voiced it. But was it a bad decision? No, it keeps the keepers safe but some didn’t like it because they couldn’t interact the way they always did. But the animals are not pets. As to beer goggles – I think it’s real easy for a lot of people to trash an organization in relative anonymity like most have done on this blog. You think I am talking about disconnected topics? Did I not talk about elephants? Their life span? The lifespan of other animals that most of us have in our families and have to make tough decisions about their health? That keeping an animal alive in a poor state of health is a bad practice? How is that disconnected? Didn’t like the comment about a living will? I am saying I like and am involved with an organization that is trying to help. Does it frustrate me when people trash them? Yes. Do you get involved to try and make the a difference? Or do you just read an employee’s negative comments, add to it a situation that the experts in the field had make a really tough decision and go “shame, shame, tisk, tisk”? Feel silly about saying if you don’t like it move to someplace without a Zoo? Not at all. I’m a firm believer in you either get involved or get lost. The real issue for elephants is the loss of habitat where elephants came from, huge human population growth and global warming that will quickly make all species threatened . If everyone focussed on doing something about the underlying issues maybe we could do justice for the remaining elephants. I am a Keeper at SDZ, and I find it cruel to insinuate the death of these animals were the result of a hasty decision and equally scandalous cover up. Euthanasia has to be approved by several departments before it can proceed. With an organization as large as SDZ Global, the idea there was any type of conspiracy to hide or cover up these deaths is pretty silly. I carry a radio for my position at the Zoo and multiple times per week you can hear appointments being set up to treat the elephants, especially Cha Cha. The veterinarians and Keepers form a very close bond with their animals and care about them deeply. For the record, I agree elephants should not be maintained in captivity, however I do appreciate the respect for animals gained when especially children see an elephant in-person for the first time. Well then, maybe you can let them know that not everyone is entranced by watching wild animals perform inane tricks. Did Cookie develop knee problems from repeatedly standing on her hind legs, “entertaining” visitors? I just became aware of the horrible Dunda story when reading Cleveland Amory’s The Cat and the Curmudgeon. I want to know where Dunda is now. Thank you.